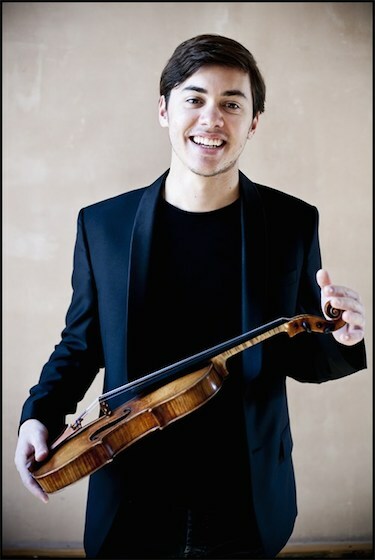 Benjamin Beilman performed the Higdon with the Philadelphia Orchestra. The Philadelphia Inquirer: "As a piece of major talent, Beilman's playing spoke for itself. Even those who heard him when he was a Curtis Institute student or a member of Astral Artists' selective roster might have been startled by his polish and power in Higdon's 2008 work (being given its first Philadelphia Orchestra performance here). An ode to Curtis, where Higdon once studied and now teaches, the first movement uses the 1726 in the school's Locust Street address as a point of departure. This is a piece of alternating extremes, intense expressivity and speed-demon virtuosity." Frank Peter Zimmermann performed the Sibelius with the New York Philharmonic (on a loaned Guarnerius del Gesù, after the lease ran out on the Strad he'd been playing). The New York Times: "Mr. Zimmermann, backed by Mr. Oramo and the inspired orchestra, powerfully conveyed the quizzical crosscurrents in the music. And the finale, which, on the surface, seems a rustic dance, here sounded modern and wild, with the violin fixating on obsessive rhythmic riffs against the swirling orchestra." Julia Fischer performed the Brahms with the Boston Symphony Orchestra. Boston Globe: "There was plenty to appreciate in Fischer’s streamlined and nimble account, dispatched with a technique that is a marvel of precision engineering." Boston Classical Review: "Julia Fischer’s performance in the solo part Thursday was impressive from start to finish. Her tone, though not the biggest, was wonderfully clear and well-produced in all registers and dynamics, and was a strong presence in the hall. Even though Dutoit didn’t hold back in the concerto’s symphonic-style exposition or the big tuttis that followed, Fischer’s entrances were so arresting that one hardly noticed the steep drop in volume." Boston Musical Intelligencer: "She is a dynamic even athletic concert artist, bending backwards and forwards even lifting the bow off the strings as if having shot off an arrow." Nicola Benedetti performed works by Vivaldi with La Cetra. The Telegraph: "The energetic moments like the storm in Summer were astonishing, passing by in a hurricane of rapid notes. More winning were the moments when the players could show off a jazz-like flexibility, like the one in Autumn when Benedetti threw a phrase and the orchestra caught it with perfect grace." Alexander Kerr performed the Barber with the Dallas Symphony. Dallas Morning News: "He brought a fetching illusion of spontaneity to the concerto’s opening, as if dreamily trying out different phrase treatments, then dispatched the perpetual-motion finale with utter authority." D Magazine: "Kerr, conductor Foster, and the orchestra successfully captured the beautiful intimacies and the sweeping, Brahmsian climaxes of the piece, with Kerr providing a serene, nicely controlled reading of the solo part." Ilya Gringolts performed the Harris with the Auckland Philharmonia Orchestra. National Business Review: "Ilya Gringolts performed with a total focus on his instrument with no ostentatious display. His restrained approach meant that the emotional urgency of the piece was conveyed purely through his total control and mercurial playing. He brought a sense of introspection to his playing as though he were the creator as well as the player of the work." Tamsin Waley-Cohen performed the Bruch with the Brighton Philharmonic. The Argus: "Stephen Bell, the conductor, had forged a strong partnership with the violin soloist, Tamsin Waley-Cohen, to produce an affectionate, but still noble, account of this favourite." Henning Kraggerud performed Mozart's Violin Concerto No. 5 with the Hallé. The Guardian: "Kraggerud has a mischievous, slightly chaotic stage presence and prefaced the work with a surreal spoken riff about poor dental hygiene in 18th-century Vienna causing horn players to retrain as violists. An encore provided a rare chance to hear Mozart’s sublime alternate version of the central adagio, forming a unique, four-movement concerto with a beginning, two middles and an end." Xiao Wang performed the Sibelius with the M.S.M. Symphony; Juilliard and the Manhattan School of Music Play Strauss’s ‘Ein Heldenleben’. The New York Times: Mr. Wang, the violinist, was also wonderfully clean in the Manhattan’s School’s Sibelius, and he made the most of its expressive opportunities. Scarcely less impressive than the soloists were the orchestras’ concertmasters, each entrusted with those extended, amorous solos that weave in and out of Strauss’s “The Hero’s Companion.” The Manhattan’s concertmaster, Matous Michal, was terrific throughout the program. And Wyatt Underhill of Juilliard presided and played as if he, like Mr. Guzelimian, were glancing next door at the Philharmonic, aware of its vacancy in the position of concertmaster. With a few more years and a little more experience, he could be thinking such thoughts. Viktoria Mullova performed the Brahms with the Orchestra of the Age of Enlightenment. The New York Times: "In the Brahms, the soloist Viktoria Mullova's work was nuanced but tentative, as if she were still thinking through period performance's implications." Karen Gomyo performed Mozart's Violin Concerto No. 5 with the Florida Orchestra. Tampa Bay Times: "Karen Gomyo...demonstrated with aplomb how technical brilliance need not be flashy when it serves purity of tone and the expressive elegance of a musical phrase. In Mozart, that's harder than it looks. Gomyo's telling of his Fifth Violin Concerto was eloquent and sublime. I might go buy another ticket just to hear it again." Anne-Sophie Mutter performed the Brahms with the San Francisco Symphony. San Francisco Chronicle: "Mutter’s artistic thumbprint has always been a certain ferocity in her playing, which gives even the most lyrical music an edgy quality. It’s an attribute that her most ardent fans find invigorating, but that can also lend a certain stridency to her performances." Examiner.com: "Anne-Sophie Mutter('s)...approach to technique was, at best, variable and (her) expressiveness was sadly limited." Akiko Suwanai performed the Beethoven with the Bournemouth Symphony Orchestra. The Guardian: "The soloist was Akiko Suwanai, a fine, refreshingly straightforward player. There was nothing contrived or affected about her performance; a few swoony phrases in the slow movement were her only indulgence in an otherwise beautiful, poised, utterly musical performance." The Telegraph: "The soloist Akiko Suwanai played the piece with a radiantly lofty and pure tone, but Karabits seemed oddly disengaged from her, so orchestra and soloist weren’t always in perfect accord." Daniel Szasz performed Piazzolla’s “The Four Seasons of Buenos Aires” with the Alabama Symphony. ArtsBHAM: "(Szasz) played with warmth and sensitivity, appropriately gritty in spots, ever relishing Piazzolla’s rhythmic buoyancy."